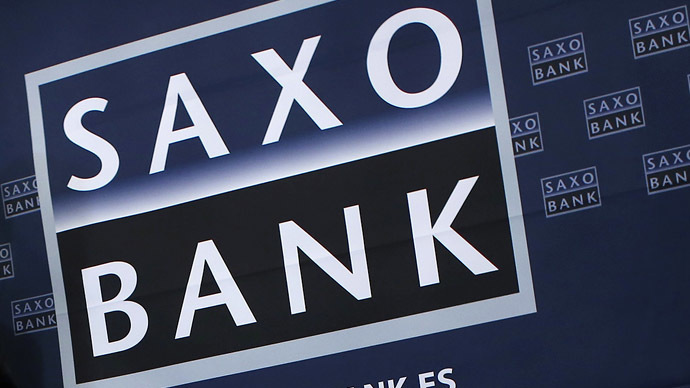 ‘Shocking’ Saxo Bank 2014 predictions: How real? Oil will slump to $80 per barrel, Europe’s strongest economy – Germany – will slip into recession – these are some of the 10 predictions for 2014 by Saxo Bank. RT has talked to the bank’s CEO Steen Jacobsen to find out how real some of them are. With growth rate remaining pretty flat the wealth tax of people with savings over 100, 000 euros will be enforced in a move for quality for all, as well in the effort to create a so-called “crisis safety pillow”. Steen Jacobsen (SJ) -I think, it’s very likely. Already beingtabled by the IMF as an indication of what’s needed in Europe. And what Europe needs of course as we’ve seen from the banking dealis to secure a certain amount of funds that can be used to recapitalize the banking system and overall support the weaker nations. So, the European economy has pretty much moved to a Soviet – style economy, the planned economy. And, I think, this would be the final straw confiscating wealth from Europeans. SJ – What you probably noticed is that in the UK Independent Party is not bigger than the Tories exactly to this European Parliamentary election. Similar, in France Marine Le Pen is having a strong winning to herself and far right in Holland which also represents an anti –EU and also is also doing extremely well in the polls. By end of May we could have potentially a situation where the biggest or the second biggest fraction of the EU Parliament would be an anti-EU one, which runs counter to what the EU Commission and most of the politicians want of course, because they want more Europe, not less. But it seems like the voters want exactly the opposite, they certainly want less Europe, not more. Tech’s “Fat Five” of Amazon, Netflix, Twitter, Pandora Media and Yelp, that are trading 700 percent above the market value, will wake up to a nasty hangover in 2013, with their shares finally bursting. SJ -They’ve had a phenomenal year, and what’s interesting is that we are not saying that technologies are expensive. What we are saying is that these names - the household names, the names people recognize, the ones that people use - are at the bigger risk. The bigger risk comes from the fact that when they buy technologies, they tend to buy what they do know. And that’s what we are trying to point out. Take Amazon, its CEO Bezos may be the most brilliant businessman in the world but that does not justify that you pay $300 for every one dollar that the company generates. He’s simply got too expensive or in his own language, as he used to say, he got too fat. Development of non-conventional methods and increased Saudi Arabia output will drag Brent oil price to $80 per barrel. SJ –It’s actually quite logical because already now in the WTI the US based production is extremely cheap and trading with a discount of $15 from the $20 to Brent oil. If we look at Brent oil itself a cause of bigger risk, or depositive risk, if you think in geopolitical terms, is that Iran comes online into production again. On top of that you have Libya and a number of other countries that over all the past couple of years have seen a much smaller production relatively. If they do come on line at the same time as they do expect a slightly weaker global growth you have almost a perfect storm in terms of the price and I should correctly say that would be a challenge to not only Russia but certainly to most of the Middle East. Germany will stop steadily growing and fail to justify the expectations. Years of excessive greed forced even the US to burst with critics of the Europe’s largest economy. It’s not excluded that other key economies will work out a joint plan to cut Germany’s excessive trade surplus. Add to this falling prices for energy sources, which will make Germany relocate their production to the West; decreasing competitiveness caused by lower real wages; potential requirements by SPD – a new coalition member – to improve welfare of the low and middle class in Germany; and growing China that makes a bet on the domestic consumption. SJ – I don’t think it’s that far – fetched. Do not forget the reason why Europe and certainly Germany did so well through this crisis is a simple fact that the emerging Asia decided to ramp up their investment all the way up to a significant part of their GDP. So, they overinvested. A large part of that investment is of course German cars, German production. Then at the same time at home you now have a minimum wage, the most expensive electricity in the world, you have seven million working poor. Germany looks better on the surface than it does underneath and I think that is what is coming to the full light in terms of the 2014. Germany is already slowing down underneath, but right now they are reporting top line very well.